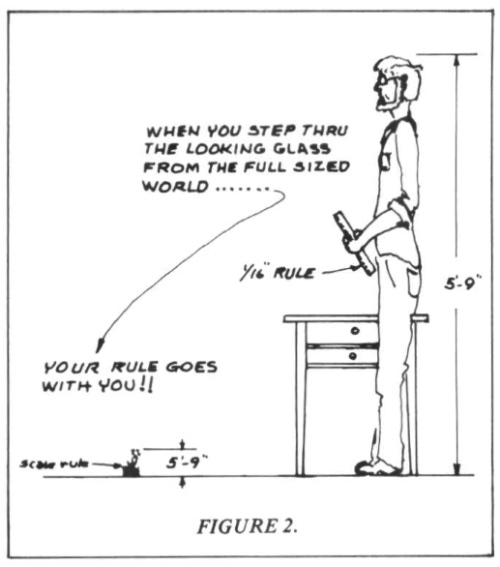 One of the most common comments about The Scale Cabinetmaker and The Cabinetmaker’s Guide is that they are “too difficult,” that they are not written for folks who are not already experts in the use of tools. The second most common comment is that we use a “weird measurement” system that requires the use of a scale or architectural rule. While we can’t really address the first set comments other than to ask folks to take a look at the index; the second set of comments go to the heart of both TSC and the Guides–the issue of scale. Swimming across what was then and still remains the dominant current in a hobby that is the preserve of the collector of miniatures, we proposed that [The Scale Cabinetmaker] should be focused exclusively on scale modeling. there were and would always be publications which reflected the interests of the collectors, the need was for one which with tunnel vision served the needs of the builder of miniatures, the person whose passion was for the process of building an object rather than possessing it. All objects have dimensions: a chair is a certain height, a couch a certain length, a drawer a certain depth. Both publications, TSC and Guides, provide plans and patterns and instruction for real objects. Because different modelers use different scales (1″:1′, 1/2″: 1′, N gauge, quarter inch, etc. ), our challenge was to provide instructions that crossed all the different scales found among modelers. Our solution, publish the plans using “full dimensions,” which meant that if the chair in real life has a height of 32″ (2’8″), then the scale plans (most drawn to 1″=1′) would also have a listed height of 32.” The trick for modelers was to translate the dimensions to the scale they use. For the 1″=1′ modeler, the chair would be 2 8/12″; for someone building in 1/2 inch scale, the chair would be 1 8/24ths (or 1 2/12″). The only bit of math involved is separating the feet from the inches. At the time both the Guides (1964) and TSC (1976) were first published, there was no such thing as a scale ruler, other than the triangular architect’s rule. Indeed, for scale modelers, the architect’s rule was the only game in town. In the years since, a number of companies (Bell, Clare-bell, Midwest Products) have come out with rulers specifically designed for use on the miniatures workbench. While we have a range of scale rulers on our workbenches, we still keep our architect’s rule near at hand because of its ease of use. The trick to using the architect’s rule is to first identify the scale you would like to use. There are 12 scales on an architect’s rule, two per “face.” The two common scales used in miniatures are 1″=1′ and 1/2″=1. These two scales are on the same face. Pick up an architect’s rule and find the face with “1” at one end and “1/2″ at the other end. Look at the 1” end of the rule (left end). The “0” represents the dividing line between inches (to the left of the “0”) and feet (to the right of the “0). The numbers and the marks to the left of the “0” represent inches (as well as 1/4, 1/2, and 3/4 marks). A measurement of 18″ = 1′ 6″. Find the one-foot mark to the right of the 0 and the six inches to the left of the 0. For a measurement that is 8 1/2 inches, find the 8″ mark and then the half inch mark between the 8 and 9. If you do not have an architect’s rule on your workbench, pick one up at your local hobby or art store (or online) and give it a whirl. You may find that it is far easier for you than you may have expected. For more information on scale and the scale ruler, check out the free sample article on “Beginner’s Workbench: Thinking in Scale,” available from Dorsett Publications. Try one of the free projects while you are there.